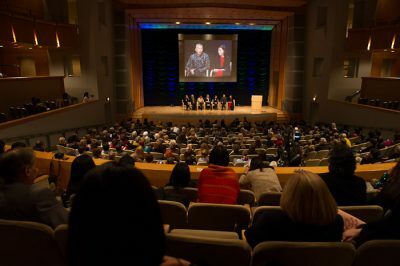 On November 29, 2012, as part of its 50th anniversary celebration, Art in Embassies (AIE), U.S. Department of State, joined with the Aspen Institute, the Woodrow Wilson International Center for Scholars, and the Ronald Reagan Building and International Trade Center to present a conversation with the five recipients of the Medal of Arts, awarded by the U.S. Department of State. Artists Jeff Koons, Cai Guo-Qiang, Shahzia Sikander, Kiki Smith and Carrie Mae Weems participated in the conversation, moderated by Glenn D. Lowry, Director of the Museum of Modern Art (MoMA), which focused on the importance of cultural diplomacy through visual arts. Poet and performer Marc Bamuthi Joseph opened the event.